The survival and wellbeing of multicellular organisms depends on good cell-to-cell communication. Helping to carry out this critical information exchange are nanoparticles called exosomes. These tiny vesicles (smaller than red blood cells), discovered about 35 years ago, were initially thought of as little dumpsters for unwanted cellular material. But further study of exosomes demonstrated their role as long-distance couriers with specific messages to carry – they can transfer biomolecules (proteins, lipids, genetic material) that impact recipient cells’ functionality in a variety of physiologic and disease processes. 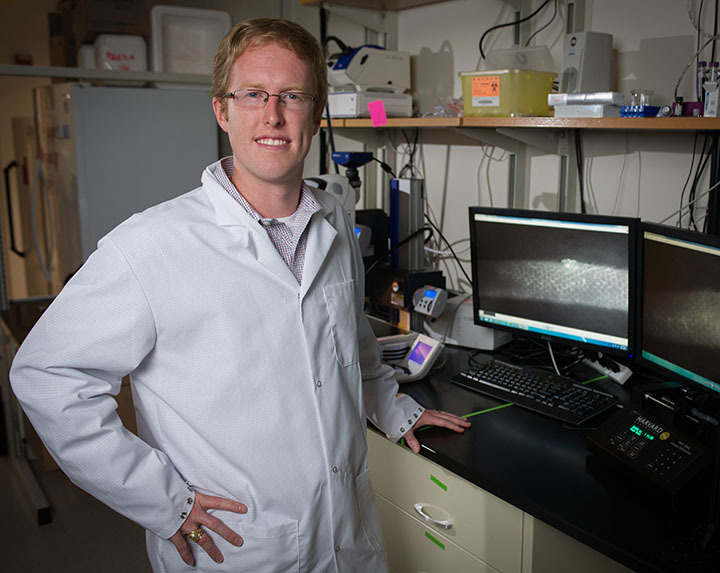 It also turns out that exosomes are in the ideal size range for lymphatic transport, and this is what really interests Brandon Dixon, faculty researcher in the Petit Institute for Bioengineering and Bioscience. Dixon, whose research focuses on lymphatic function, attended a presentation by fellow Petit Institute researcher Fred Vannberg several years ago. Vannberg’s lab uses computer algorithms and genomics to investigate infectious diseases, and this includes the role of exosomes during infection. His presentation that day described the characteristics of exosomes, which when released in the periphery are too big to be taken up by blood vessels, but just right for lymphatic transport. So, utilizing a Petit Institute seed grant, Dixon and Vannberg brought their distinct skills together to produce a groundbreaking research paper, “Lymphatic transport of exosomes as a rapid route of information dissemination to the lymph node,” published last month in the Nature journal, Scientific Reports. 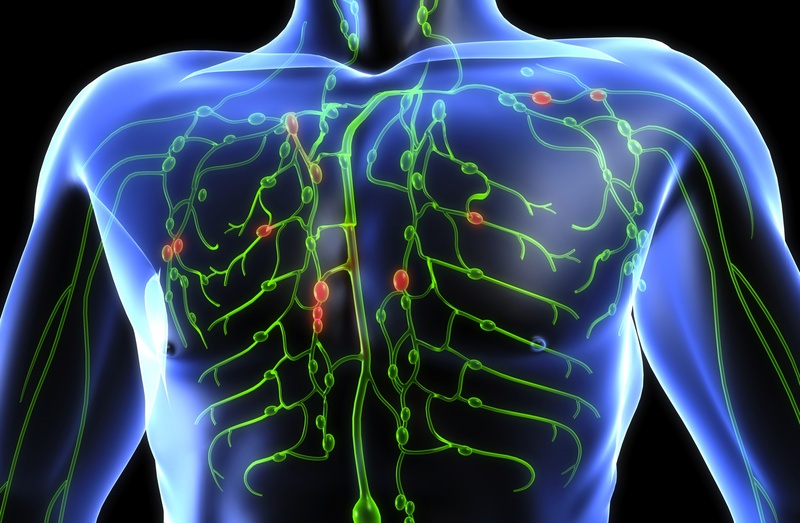 Their results suggest that exosome transfer via lymphatic flow (from the periphery to the lymph node) could enable a rapid exchange of infection-specific information that precedes the arrival of migrating cells, priming the node for a more effective innate immune response, or “a first warning response during infection,” Dixon explains. In previous research, Vannberg has tried to quantitate the body’s ability to fight infection, focusing on tuberculosis and leprosy. He became especially interested in exosomes’ role in our immune system’s ability to detect and fight disease after reading the research of Notre Dame researcher Jeff Schorey, who identified exosomes as ideal for diagnostic development. Lead author on the paper was biology grad student Swetha Srinivasan, who is co-advised by Dixon and Vannberg. They designed the experiments and she carried out the experimental work, while all three analyzed the data, wrote and reviewed the manuscript. Their published research illustrates a potentially efficient pathway for targeted therapeutics, somewhere down the line. “We believe this work has far-reaching implications on how biological systems – like pathogens, immune cells and cancer cells – could utilize lymphatic transport of exosomes to rapidly manipulate the lymph node environment,” Dixon says. An upcoming paper will help determine what actually happens when exosomes arrive in the lymph node.